Livshits, Vladimir A. 2015. Sogdian epigraphy of Central Asia and Semirech’e. (Ed.) Nicholas Sims-Williams. (Trans.) Tom Stableford. (Corpus Inscriptionum Iranicarum. Part II Inscriptions of the Seleucid and Parthian Periods and of Eastern Iran and Central Asia Vol. III. Sogdian). London: School of Oriental and African Studies (SOAS). This volume presents the Emglish translations of some very important and major works of Vladimir Aronovich Livshits on the Sogdian language, culture and sources. The volume is arranged in two parts. The first part is a translation of Sogdian documents from Mount Mug (kuh-e moḡ), site of the 7th-8th-century refuge of the rulers of Penjikent in Sogdiana, located in the upper reaches of the Zeravshan in northern Tajikistan, where an important archive of documents written in Sogdian was discovered by A. A. Freiman’s 1933 expedition. Livshits has taken part first and foremost, in the deciphering of the Mnt. Mug archive of Sogdian documents from Mount Mug. 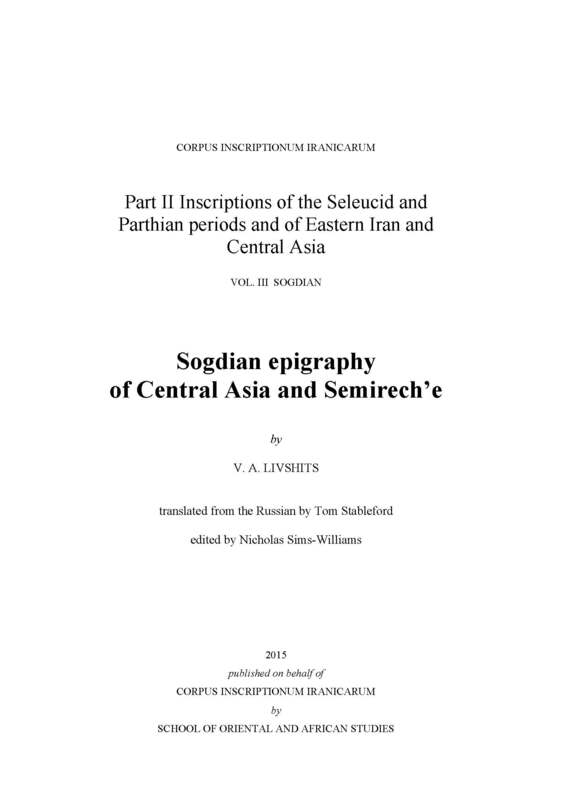 The second part of the volume, dedicated to the English translations of some ten important articles of Livshits, concerning the Sogdian epigraphy, in which he examines “not only the purely philological problems but also questions of the history and culture of Sogd, aided by his frequent participation in archaeological excavations and journeys to the lands of historical Sogdiana in Tajikistan, Uzbekistan and Kirgizia”. Vladimir Aronovich Livshits is Chief Researcher at the Institute of Oriental Manuscripts (IOM) of the Russian Academy of Sciences (RAS).